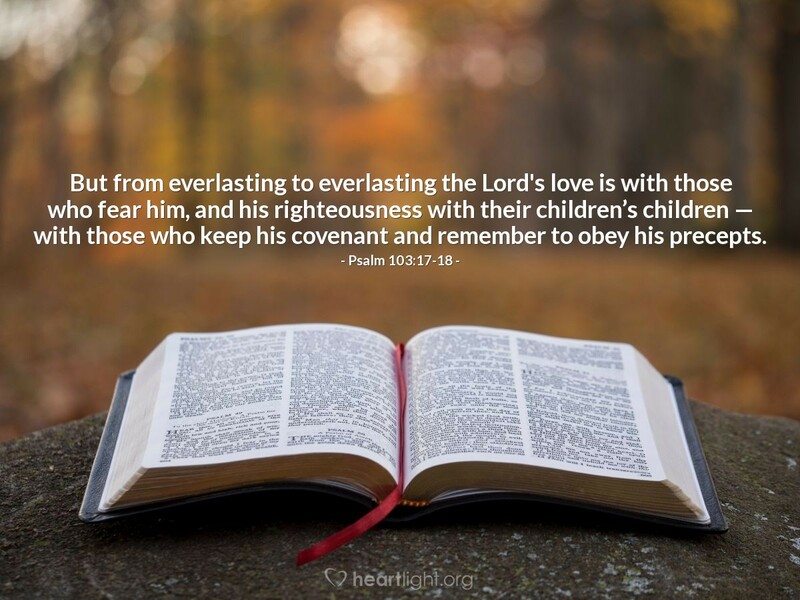 But from everlasting to everlasting the Lord's love is with those who fear him, and his righteousness with their children’s children — with those who keep his covenant and remember to obey his precepts. Forever love is talked about in dime store novels, but this kind of love is only found in God. We tap that reservoir of eternal and divine love through the Holy Spirit who helps us both receive it and share it (Romans 5:5). The Lord asks us to share his love and righteousness with the generations that come after us. We do this by remembering what the Lord has promised to us and by obeying what the Lord called us to do so that future generations can see and know the greatness and graciousness of our magnificent God. O God of glory and grace thank you for your promises, your covenants, and your love. May I live in such a way that others, especially those who come after me in my family, know that your love is from everlasting to everlasting. In Jesus' name I pray. Amen.